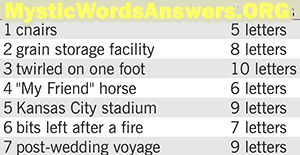 In just a few seconds you will find the answer to the clue “Post-wedding voyage” of the “7 little words game”. Now back to the clue “Post-wedding voyage”. Here you’ll find the answer to this clue and below the answer you will find the complete list of today’s puzzles. Now just rearrange the chunks of letters to form the word Honeymoon.